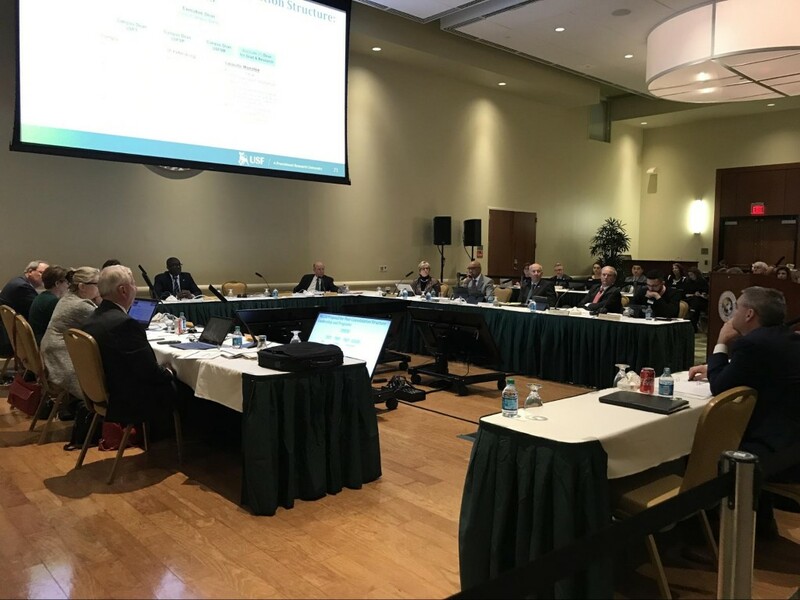 USF’s Board of Trustees (BOT) met with the Consolidation Implementation Committee (CIC) on Monday afternoon to discuss one of the most important changes facing the university — consolidating USF’s three campuses into one. The CIC presented its progress from the past four months to the BOT and about 100 USF faculty, staff and students in the Marshall Student Center’s Ballroom A. The 86-member committee has been meeting to determine the best way forward as USF works to meet the state-mandated single-accreditation requirement by the summer of 2020. One of the BOT’s seven guiding principles for the CIC was to embrace a model of “One University Geographically Distributed,” but, according to CIC co-chair Pritish Mukherjee, that sparked some discussion within the committee. After reading through the rest of the BOT’s guiding principles and showing where USF ranked on several academic categories based on its goals, Mukherjee and the CIC presented its actual progress, breaking down how much they have accomplished into three categories — materially completed; consensus reached, work underway; and intensive effort underway. The CIC also brought up three different “case studies” that highlighted some of the more important issues it is facing with consolidation. The first case study was concerned with where students called “home” while at USF. Part of the application would require students to indicate a housing preference between the three campuses. Would students have advantages or disadvantages based on where they chose to live while enrolled at USF? Neither the CIC nor the BOT had answers. The second was a discussion about student fees. Currently, students are charged different fees per credit hour — $59.24 at Tampa, $53.49 at St. Pete and $45.71 at Sarasota-Manatee. BOT member Byron Shinn, who represents the Sarasota-Manatee campus, said that having students at that campus pay the same fees as those who are enrolled at Tampa may not make sense. He added that Sarasota-Manatee students should not have to pay the athletic fee that Tampa students do, because there are no sports teams on the Sarasota-Manatee campus. The third and final case study was about academic structures. According to SACSCOC, the regional body for accreditation granting higher education degrees in 11 states, there can only be one college within a given discipline. Currently, USF Tampa has its Muma College of Business and USFSP has its Kate Tiedemann College of Business, but the CIC offered a recommendation for this problem. 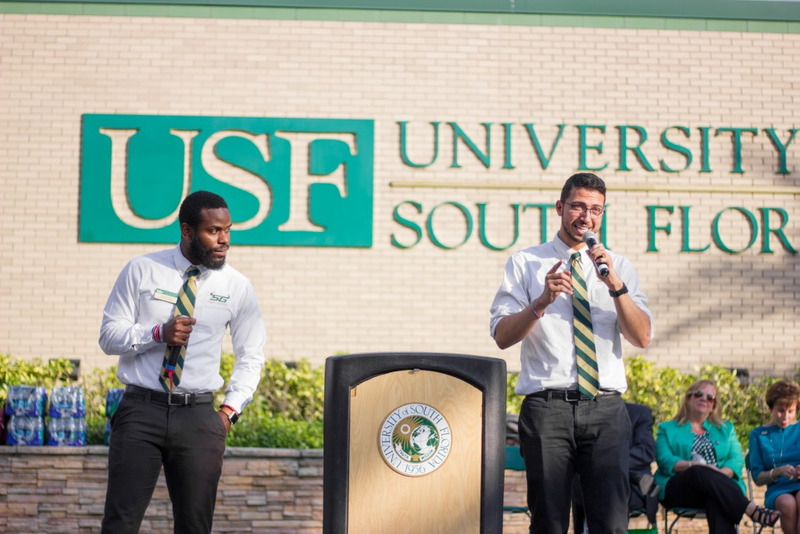 After consolidation, the committee suggested that USF’s School of Business would have deans at each campus who would report to an executive dean. BOT member Les Muma presented a structure and later clarified it in an interview with The Oracle following the meeting. “One president, one accreditation, one dean for each major college and the deans all report to the provost,” Muma said. Next on the agenda for the CIC is to finalize a consolidation implementation plan by Feb. 11 and present the plan to the Consolidation Accreditation and Preeminence Committee of the Board of Trustees the day after. In the closing moments of the meeting, each trustee was given a chance to ask one more question or make a final statement. Muma said that though he is impressed with the work of the CIC, he does have concerns of meeting the deadline given by Florida’s Board of Governors — which is set to have consolidation fully completed and implemented by the summer of 2020. Muma also added that the BOT will be able to change things post-consolidation, should they find it necessary.